Reduce burns and singed hair with heat-resistant silicone cooking gloves from L.A. Sweet Home. It doesn't matter if you've spent 30 years in the kitchen as a professional chef or you're just starting the path to becoming a backyard BBQ master, protecting your hands from heat and fire is essential if you'd like to keep enjoying the art of food preparation. That's why you need the best silicone cooking gloves for your indoor and outdoor cooking adventures-the L.A. Sweet Home Silicone Cooking Gloves set. Made with premium food grade safe silicone, our oven mitts give you extra protection from burns and scalds thanks to their flexible, heat-resistant exterior and soft, quilted liner. Boasting a waterproof, non-slip grip, you'll find maintain a proper hold on hot pans, steaming pots and steaks hot off the grill. Dishwasher safe and tough enough to handle baking, grilling and stovetop cooking, you'll love their style and versatility. Click 'Add to Cart' now to protect your hands while cooking or over open flames with this versatile, heat-resistant silicone glove set from L.A. Sweet Home. ADVANCED HEAT RESISTANCE - These heat gloves for cooking offer heat protection up to 480° F, keeping fingers and hands safer while handling a barbecue grill, hot pans or plates, or working over a fire pit's open flame. MULTIPURPOSE VERSATILITY - Better than your average kitchen gloves, these silicone oven mitts offer premium safety while setting up campfires, moving wood into a fireplace, smoking turkeys for Thanksgiving and so much more. IMPROVED NON-SLIP GRIP - Silicone not only provides better heat resistance; we've also created a "waffle" pattern to improve your gripping power while carrying dinnerware, cookware, kitchen utensils and serving trays. STYLISH, KITCHEN-FRIENDLY COLORS - Just because they're safety gloves doesn't mean you can't be fashionable. 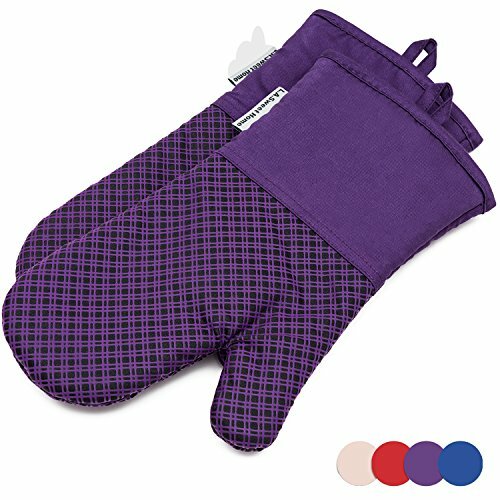 These gloves come in a variety of fun, vibrant colors to match your kitchen décor and your personal style. EASY TO CLEAN & STORE - Each pair of oven gloves is extremely easy to clean, super durable and features a cotton loop inside so they can be hung in a cabinet, near the grill or in a pantry. Wash with warm, soapy water in between uses. If you have any questions about this product by LA Sweet Home, contact us by completing and submitting the form below. If you are looking for a specif part number, please include it with your message.